Animals unattended, abused and neglected. Throughout the world, dogs and cats, and other animals, are left to fend for themselves, and even some sick people make sport of them, abuse them or outright kill them. Give to your local shelter or animal welfare facility: your time, a monetary donation, some supplies. Spay or neuter your pet, if you have one. It makes for a healthy, happy, safe pet. ADOPT or FOSTER!!!!! Take in a sweet kitty or doggy and, rest assured, you will be showered with kisses and all kinds of love and affection. Tweet or Facebook-post articles about animals needing adopting or fostering, being abused or neglected or killed, or being slaughtered for food that we really can do without. Greet and pet a lovely animal on your daily errands. The mutual affection will do you both good. Last, but not least, eschew from eating ANY animal products. How could one love some animals and eat others and NOT be anything but a hypocrite?? And SOLVE our animal problems. 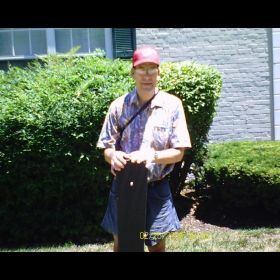 I am a folk/country/pop/rock songwriter in Arlington, Virginia, just outside Washington DC. I enjoy writing most of all, although I do possess considerable live performing experience, from busking in Farragut Square downtown to bars to coffeehouses.